On the 26th of September leaders, activists and artists gathered for the Marie Claire Future Shapers Awards 2017. In an evening that celebrates the successes and diverse contributions of women to civil society from not just the fashion field, our very own Fatima Zaman was among the awardees. Shortlisted for her groundbreaking advocacy work and contributions to countering and preventing violent extremism, Fatima was named as one of Marie Claire’s Future Shapers and someone to watch for the Future! 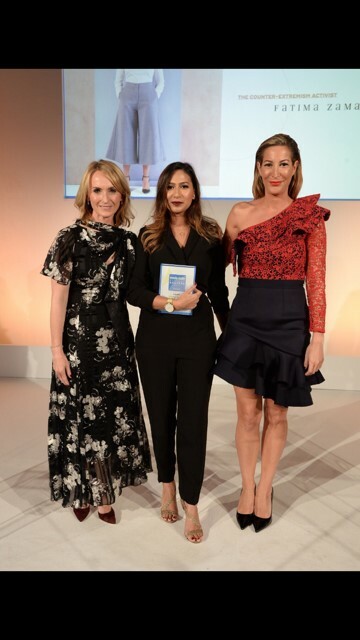 Upon receiving the award our UK leader said she was delighted to be shortlisted and recognised for her work towards supporting young women reject violent extremism. Extremely Together is delighted to congratulate Fatima Zaman on her recognition as a Future Shaper, and is also pleased to have been shortlisted by the Digital Communications Awards for its campaign countering violent extremism.